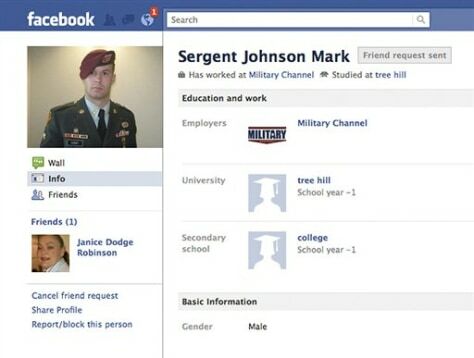 This screenshot shows a Facebook page set up by a person impersonating Army Sgt. James Hursey and showing Facebook friend Janice Robinson. Hursey, 26, discharged and sent home from war in Iraq to nurse a back injury, found a page with his photos on Facebook — on a profile that wasn't his. It was fake, set up by someone claiming to be an active-duty soldier looking for love. The fake's cover was blown by Robinson after she had begun talking to him thinking he was one of several people named Mark Johnson that she knew.